Leanne Cope with Robert Fairchild in An American in Paris. Photo Courtesy Trafalger Releasing. Former Royal Ballet first artist Leanne Cope made the ultimate ballet to Broadway crossover. In 2014 she was asked by choreographer Christopher Wheeldon to originate the role of Lise Dassin, a hopeful young ballerina, in his new stage production of An American in Paris. Alongside former New York City Ballet principal Robert Fairchild, Cope starred in critically acclaimed runs of the show on both Broadway and London's West End. Though the production closed in London last January, audiences will have the chance to see Cope and Fairchild in their original roles in a filmed version of the West End production in movie theaters around the US and Canada September 20 and 23. Pointe caught up with Cope to find out what it's like seeing herself on the big screen, her advice for ballet dancers interested in musical theater, and how she managed dancing the same steps eight shows a week... for nearly four years. To see if An American in Paris is coming to a movie theater near you, click here. What was the best part of doing An American in Paris? One of the most exciting parts was opening on Broadway and opening on the West End. They were two very different evenings, but by the time we got to London I knew the show much better, so it was nice to know that I felt comfortable in the role. Getting to perform at the White House for Michelle Obama was also amazing—there were so many things, it's hard to pick just a few. How do you think that this show changed you as a dancer? It helped my confidence. I danced in The Royal Ballet for 12 years, and being in a classical ballet company, in a rep company in particular, you're constantly having to change. You could be dancing Swan Lake in the evening, but rehearsing Romeo and Juliet and Nutcracker during the day, so you never go to a point where you feel fully comfortable in a role. One of the highlights of doing this show was doing it eight times a week. I knew that if I did it yesterday I could do it today and I could do it tomorrow. It got to the point where I could experiment a bit and play with the musicality and try different interpretations. It gave me more freedom, which I really liked. What's it like seeing yourself up close on-screen? It's strange! When I was in The Royal Ballet we did film things for cinema, but to hear your voice is strange. I'm used to seeing my dancing, but to see your face and reactions so close is more scary. How did you keep yourself going, eight shows a week? It was knowing what day of the week it was and how much you could push yourself each day. We worked Tuesday through Sunday, so I knew Monday was my rest day, and I made sure I really did rest that day. On Tuesday I could push myself quite far and do a full class, Wednesday and Thursday I'd do a barre and a some center work, and then as the week went on I figured out what I needed to do to get myself through. I would also go to PT twice a week, because dancing the same steps eight times a week was hard. Every arabesque was on my right, and that side would get very tight, so I tried to even my body out a little bit. It's all about listening to your body, eating the right things and resting. 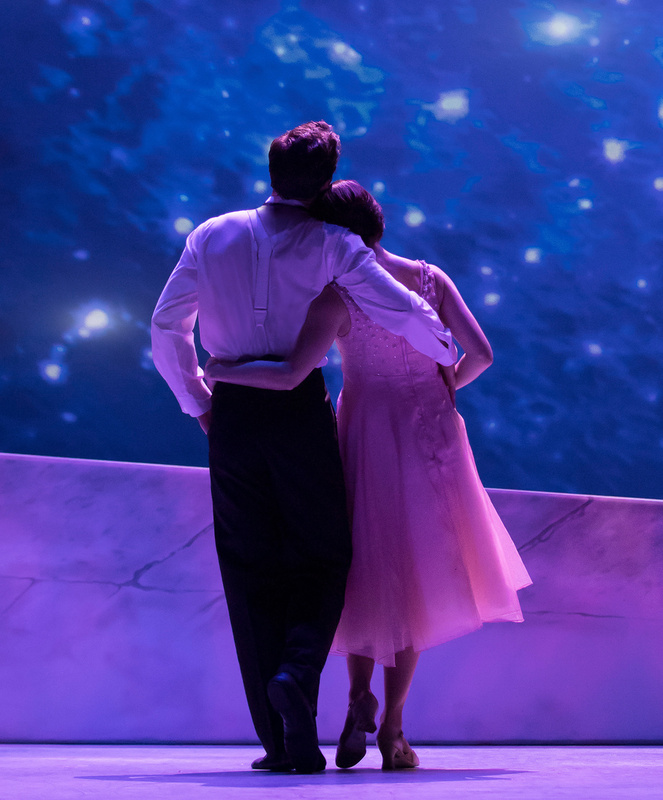 Cope and Fairchild in the closing scene of "An American in Paris." Photo Courtesy Trafalger Releasing. What makes this show relevant today? What do you hope that audiences will get out of the film? Unfortunately we live in a world where there are still wars going on, and people living scared and in hiding. So even though the show takes place just after the second World War, there are so many parts of the world that are dealing with that right now. And at the end of the day, it's a love story, it's a story about celebrating your heart. Even if ballet's not your thing, there's jazz and tap in there, and Gershwin music. There's so much to see. Do you have any advice for ballet dancers who are thinking of crossing over into musical theater? Ballet dancers tend to be very focused on just ballet, so I would give this advice to dancers even if they didn't particularly want to go into theater. With ballet now, there's no such thing as a company that just does pink tights, tutus and tiaras. Every company has contemporary work, so it's important to embrace all styles of dance. And for the acting side, it's really important that dancers, particularly in classical ballets, prepare thoroughly for roles. That they read Romeo and Juliet and watch every version of the play or the movie, so that they can understand the story that they're trying to tell. And the thing I'd take from the singing would be the breathing. As ballet dancers we tend to breathe very shallowly and very high up in our diaphragms, and to learn to breathe properly really helps as well. I'm teaching a lot at the moment. And then there is something coming up next year, but I'm not allowed to say what it is. It hasn't been announced yet, but it's another show in the West End, which should be very exciting.